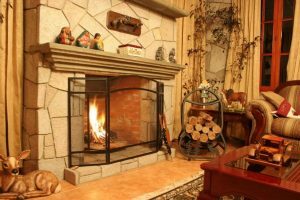 Do You Need a Fireplace Screen or a Fireplace Door? One of the more interesting applications for custom ironworks is for personalized fireplace screens and doors. We’ve done more than our fair share of them at Cacciola Iron Works, and often hear people ask if they should have choose a screen over a door or vice versa. Here are some simple things to keep in mind when you’re making the decision, because while both can be visually appealing, they serve different purposes. Fireplace screens are detachable (or sometimes freestanding) constructions that serve primarily to prevent embers and ash from be blown into the room in the event of a downdraft. This helps to keep the room clean, and prevent accidental fires. While they come in just as many varieties as screens, fireplaces doors have a different purpose. Unlike a screen, fireplace doors usually enclose the entire fireplace and are anchored to it, with an opening for managing the logs. They’re intended to ensure that the heat remains in the room when the fireplace is in use, and that heat doesn’t enter through the chimney during the summer. It’s worth noting that this doesn’t have to be an either/or choice. It is quite possible to effectively use both on one fireplace. Your decision should be based on the needs of your home, and the local climate. Whichever you decide to use, your friends here at Cacciola Iron Works can produce the perfect screen or door to match your home and decor. Contact us to learn more about the process, or to begin work on your design!